Gardenia pruning transforms straggly plants into nicely shaped shrubs or houseplants. Tackle gardenia pruning at the right time and with the proper tools to ensure success. Most people prune gardenias to shape them or remove unsightly deadwood. Gardenias actually need very little pruning, and most pruning is done for aesthetic reasons. Once every two years is probably often enough, unless your plant is growing so vigorously it really needs to be trimmed back to attain a pleasant shape. Gardenia baskets, topiaries and other houseplants may need more frequent trims to keep their beautiful form. Gardenia pruning requires a deft touch and patience. When trimming gardenia plants, never trim shorter than four to six inches from the base of the plant. Cutting gardenias shorter than this doesn't leave the plant with enough growth to support itself. For successful gardenia pruning, it's essential to use the right gardening tools. Although you may have pruning shears in the garage or potting shed, using dull, rusty, or flimsy pruning shears damages the gardenia's woody stems. Woody stems comprise the plant's vascular system and transport water and essential elements throughout the plant's system. If it's damaged, your gardenia may fail to thrive. Using sharp pruning shears ensures a nice, even cut without crushing delicate tissues.Most hand pruners are either bypass or anvil pruners. Bypass pruners function like a pair of scissors, with the two blades joined by a screw. Anvil pruners work like a knife against a cutting board. The top blade slices downwards onto a stationery bottom blade. While either type of pruner works for deadheading and shaping plants such as gardenias, for gardenia pruning, experts recommend a bypass pruner. The cleaner cuts heal faster and cause fewer problems than the more crushing-type of action of the anvil pruner. Felco pruners: Nurserymen swear by Felco pruning shears. The lightweight feel and silky cutting action make gardenia pruning a breeze. Felco pruners come in a variety of sizes, indicated by a number. Choose pruners based on the diameter of the branch you need to cut. Felco 2 pruners provide a solid, smooth cut for outdoor gardenia branches and other shrubs with branches three quarters of an inch or smaller in size. Felco 300 series snips and shears may be all that's needed for gardenia houseplants. Popular Mechanics magazine tested 12 pruner brands, and Felco 2 pruners were the best brand among those they tested. Fiskars pruners: Fiskars produces pruners, scissors and similar items. Fiskars pruners are easy to find in most home and garden centers, and provide solid steel construction and excellent pruning ability. Time gardenia pruning to coincide with the plant's flowering cycle. The best time to prune gardenias is right after it's finished blooming but before buds for next year have set. Wait until the very last blossoms fall off naturally from the gardenia, and then prune it into the desired shape. This usually happens towards the end of summer or in the early fall in most gardening zones.If you prune your gardenia too early, you'll destroy whatever blossoms remain on the plant. Pruning too late destroys next year's flowers since it removes the newly formed buds. To trim gardenia houseplants, look at your plant carefully from all angles and sides. Do you notice any branches, leaves or stems sticking out at unusual angles? 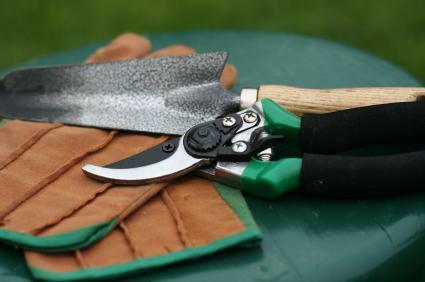 Using small hand shears or pruners, carefully trim off unsightly pieces. Remove stems without growth, as these are probably dead. For an outdoor gardenia shrub, step back and assess how it looks in the landscape. Is its form pleasant? Are there any dead branches? Is the plant interfering with important structures, such as a window, telephone line, electricity meter, or satellite dish? Carefully prune away deadwood, and use your pruners to shape the gardenia. Remember not to cut it down too much. Leave at least four to six inches on any stem to ensure the gardenia stays healthy. Properly caring for your garden tools ensures that the next time you reach for them for gardenia pruning, they'll be ready and waiting. Follow these tips to keep tools in great shape and prevent tools from spreading plant diseases. Clean pruning shears after each use. Hose them off and leave them in the sun to dry, or use a clean cloth to dry them. Store only dry tools. Wet tools encourage rust formation. Use a weak bleach solution to disinfect tools. If your gardenias have problems like molds or fungus, pruning an infected gardenia and using the same tool on a healthy plant may spread the infection. Create a weak bleach solution and dip or soak pruners to kill infectious agents. Sharpen blades using a wetstone. Remove nicks in the blade by filing them smooth. Prevent rust. Immerse tools in a bucket of sand to prevent rust from forming on the blades. Texas A & M University offers comprehensive information on pruning techniques. Learn more about gardenia pruning on Gardening Know How. Study gardenia care basics to ensure a comprehensive plan to keeping your gardening beautiful. Gardenia problems plague even the most experienced gardener. Learn how to tackle gardenia problems before they damage your plant.